That’s right, it’s recruitment season for Extension Master Gardeners! Recruitment is the process of attracting, training, and appointing new Extension Master Gardeners. It’s time to get the word out about the Extension Master Gardener Program so that we can grow our family of green thumbs and get more people involved sharing knowledge and empowering our communities. Now that we’re all excited about bringing in the next batch of Master Gardeners, how do we start? The following are a few easy steps to getting started with recruitment. Put out flyers around your community. Many grocery stories, libraries, and community centers will have bulletin boards where you can put up flyers to reach a wide range of people who may be interested in becoming Master Gardeners. Go to Community Events. Attend the local farmer’s market and hand out flyers, or if your unit runs a help desk, consider putting up a poster or providing brochures advertising for recruitment at your booth. Post on Social Media. If your chapter has a Facebook page or other social media platform, make a post advertising recruitment for your followers and encourage current members to share the post on their own social media to reach a broader audience. Make a Press Release. A press release is any written or recorded statement sent to a member of the media. This includes radio announcements, newspaper ads, or television interviews. Reaching out to your local radio stations, newspapers, and news stations is an effective (and free) way to get the word out about recruitment. You can address these questions and any others that might arise by holding an interest or information session. This also gives interested participants the opportunity to meet current Master Gardeners, hear about their experiences, and get a better idea for whether the Master Gardener program is right for them. You’ve gotten the word out, held your information sessions, now what? Now it’s time to start raking in those applications! Being an Extension Master Gardener is a big commitment, so an important part of applications is ensuring that new recruits understand the dedication being asked of them. After you’ve finalized your applicants, it’s time to start tending your trainees and supporting them as they grow into new Master Gardeners. Once they’ve completed training, you’ll have a whole new set of helping hands out in the garden just in time for spring. Recruitment is an important part of the Extension Master Gardener program because it helps us keep our programs thriving. We love to see new faces joining the Master Gardeners because it helps us achieve our goal of community empowerment. Each new member to Extension helps us reach a new facet of the community. Through inclusive recruitment, we are able to involve more people and use diverse perspectives to develop efficient solutions to the problems facing our communities today. How Can the State Office Help with Recruitment? The State Office is a great resource to reach out to if you need help with recruitment. We have a number of templates for recruitment materials which are customizable to your unit. For example, you can customize any of our templates to include the name of your unit, photos from your unit, or special information about your projects or training requirements. Ask your local Extension agent or EMG coordinator to contact the State Office about these resources (they can email Devon Johnson at dvj@vt.edu). Additionally, remember that the VCE indicia statement and ADA statement should be placed on all recruitment materials distributed to the public. These statements help us ensure that we are reaching the broadest possible audience and welcoming all members of our communities into the Extension Master Gardener program. Finally, the State Office also recommends additional resources that may be useful for creating your own recruitment material or infographics, including sources for attribution free images (images you can use without citing the photographer) and easy-to-use graphic design programs. Recruitment is an important component of keeping Extension Master Gardeners involved and active in the community. There are a number of ways that you can get involved in recruitment, such as advertising through flyers, social media posts, attending local events, or making a press release. 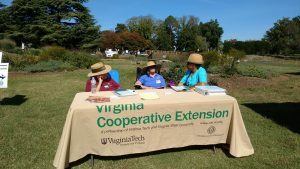 Hopefully, the ideas and resources listed here will help you grow your Extension Master Gardener unit and get the word out about all the great work Extension Master Gardeners do across Virginia. Hi Cory, to become an EMG, you can visit http://blogs.lt.vt.edu/mastergardener/prospective-master-gardeners/contact-your-local-vce-office/ to find contact information for your local unit! They will be able to offer specific guidance on the application and training processes for that unit!